ColecoVision.dk Homebrew Section Presents: Russ Kumro. Russ kumro is an active programmer for ColecoVision, and mostly a part of the team for CollectorVision. The arcade game Side Trak by Exidy, was planned to ColecoVision, but unreleased. Released via CollectorVision in April 2012. Monster Bash, based on the Arcade. Will maybe get a release in 2015/16. 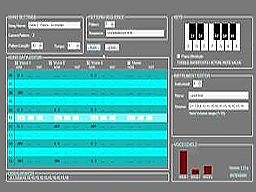 CV Tracker, a vaporware music program for Windows to make music on ColecoVision. Ripcord, was an unreleased prototype by Exidy, was planned to ColecoVision, but unreleased. Release via CollectorVision in 2015. To get in touch with Russ, try this: AtariAge or e-mail.